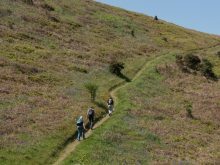 Click on the links below to have a look at the details for each of the South West Coastal Path walking holidays that we offer in north Devon. North Devon Coast Path: Minehead to Westward Ho! We offer three itineraries from Minehead to Westward Ho! - choose from 7, 8 or 9 days walking. This section of the South West Coast Path follows a quieter and remote section of the trail passing through Exmoor National Park. You will walk over high cliffs, past sandy beaches and through ancient coastal woodland.